NASA has taken 3D printing to a whole new level, having successfully tested a 3D-printed rocket fuel pump that could be used to launch missions to Mars in the future. The rocket pump was tested at NASA's Marshall Space Flight Center in Huntsville, Alabama, and was exposed to the extreme heats found inside a rocket engine, which burns at temperatures greater than 6,000 degrees Fahrenheit (3,315 degrees Celsius). "Over the course of 15 tests, the turbopump reached full power, delivering 1,200 gallons of cryogenic liquid hydrogen per minute--enough to power an upper stage rocket engine capable of generating 35,000 pounds of thrust," NASA said. The pump was designed to include 45% fewer parts than similar parts, and NASA says it used several companies to build each part, with the 3D printing process layering metal powder materials and then using lasers to melt them together. "Several companies have indicated that the parts for this fuel pump were the most complex they have ever made with 3-D printing," said Mary Beth Kolebl, deputy manager of Marshall's Propulsion System Department. You can watch the 3D printed rocket fuel pump in action below. NASA says 3D printing parts saves time and money, noting that designing and testing the fuel pump and other parts like injectors and valves took two years, while traditional manufacturing processes would have taken double that time. What is most interesting is that the tests proves that NASA could end up using 3D printing to build an entire spacecraft. "NASA says the "engine thrust class and propellants" was designed within the performance parameters of its Space Launch System, which is set to be the most powerful launch vehicle ever built and could "enable missions even farther into our solar system to places like Mars". 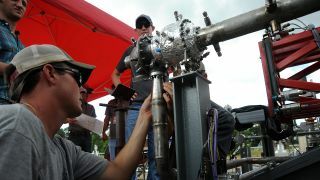 These tests, along with manufacturing and testing of injectors and other rocket engine parts, are paving the way for advancements in 3D printing of complex rocket engines and more efficient production of future spacecraft," NASA said.